I’m not a fan of ‘traditional’ styling in general BUT (and this is a BIG ‘but’) I do respect traditional craftsmanship. This has surprised me somewhat. I always thought I was a modern and contemporary gal. But nope, I’ve been proven wrong. When researching furniture and producing a board to illustrate my understanding of the use of furniture in interior design I stumbled across a beautiful and exquisite example of an original 18th century Chippendale console table. 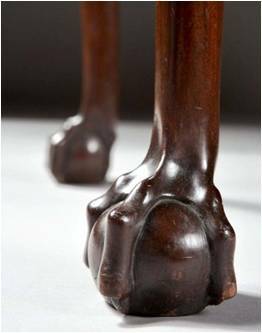 What attracted my attention was the ‘ball and claw’ feet. It’s virtually impossible to witness this depth of detailing, skill and craftsmanship in the present day. And what’s more intriguing is how current designs have taken inspiration from these cherished and historic pieces. Bravo!! Long live the legacy of Chippendale and similar period pieces, that’s what I say!